Perhaps I should’ve been polite and said nothing, but I couldn’t help myself. Without missing a beat, I said that I was a capitalist, and that I had no problem making money off of the work I do. If you are an artist of any sort, (writer, musician, illustrator, web designer, etc. ), what you produce is unique. Therefore, it has value. No one can produce things exactly like you produce them. Do you have any idea how special that makes every individual artist? Making asinine comments like the one made by the woman at the party implies that our uniqueness as artists is meaningless. 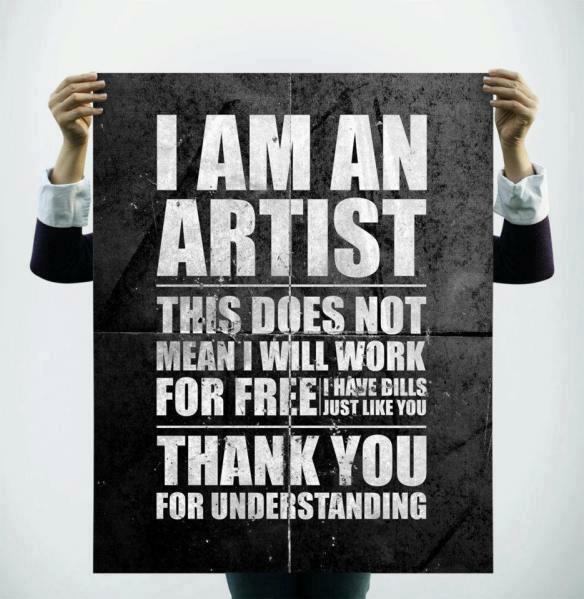 Just because artists enjoy what they do does NOT mean we should do it for free. This idea that artists have to be starving to hit major breakthroughs has created such a false reality. Many of the great breakthroughs in art happened as a result of artists being financially supported by patrons. In fact, if you didn’t have a patron in earlier centuries, you were thrown in jail, because without a patron you were considered a jobless vagrant. In other words, when artists are financially supported by patrons, they have the ability to focus on their art completely. When they do not make money from their art, artists most likely have to work grueling hours at some other (crap) job to pay the bills, and then somehow they must find the time, money, and energy to produce their art in the few hours that they aren’t working, eating, sleeping, or commuting. AND YET, people still have this mentality that artists must be free spirits and penniless, or they are not REAL artists. Unless your anti-capitalism idealism buys your paints and canvases, pays for your rent, and helps you market your work, I’m sorry, but money is as necessary a tool as the rest of your art supplies! Do you have to make money to be a real artist? No. But making money from your art separates the professionals from the hobbyists. There is nothing wrong with being a professional, and there is nothing wrong with being a hobbyist. I’m a professional, because the income I make comes from my work as an artist. I don’t have another job supporting what I do. I sell my fiction, and I also sell my services as a writer and editor. Some people say that freelance writing and editing is not artistic. These are people who are obviously not freelancers. I admit that a lot of my client work is more on the business and marketing side, so I’m definitely not writing Shakespeare, but what I produce for clients requires a level of creativity and skill. In addition, what I do for clients is something they cannot do for themselves. That’s why they hire professionals like me. They need art, but they are not artists, so instead they become patrons and hire artists. Selling your art or your skills as an artist is not for everyone, though. I have many friends who are amazing hobbyists, but they don’t have the mentality to work as professionals. Perhaps they don’t like the deadlines, or maybe they don’t like working with clients. Whatever the reason(s), it’s important to know if you are a hobbyist or a professional. I’ve seen far too many people kill themselves and end up hating their art, because they tried to be professionals, and they simply didn’t have that skill set. It’s not that they weren’t skilled artists – in fact, some of the most talented people I know are hobbyists – but being able to code switch back and forth between artist and entrepreneur is a talent that you either have or you don’t. In many ways, I interpret pretentiousness as something akin to a psychosis. 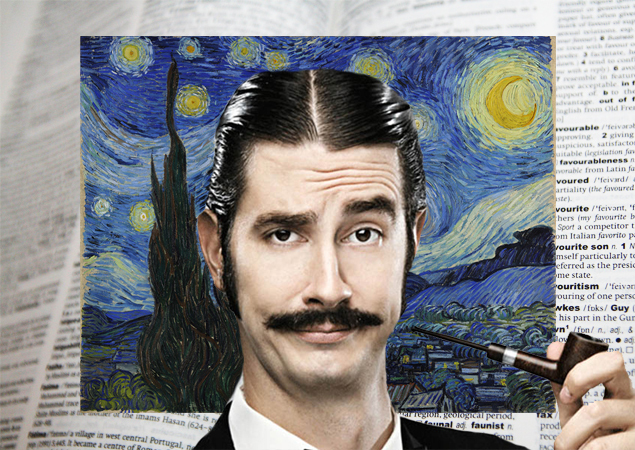 Many people are obsessed with the idea of being considered an artist. The image consumes every waking moment of their lives, because they want so desperately to be identified in this world as the next greatest artist. 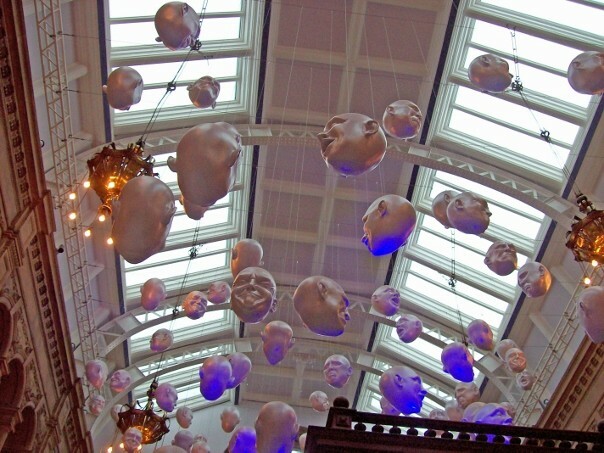 Therefore, they alter their personalities and become the stereotypical artist. Part of this psychosis also involves a refusal to take on responsibility. For example, if an artist has had a negative experience with a client, or if an artist goes through rejection, instead of taking on the responsibility of correcting the problem or learning from the mistake, the pretentious artist instead blames the client, blames whoever rejected them, and then blames the whole system. To continue avoiding any chance of responsibility, the artist will then stop submitting their work or stop working for clients, and instead adopt pretentious ideologies that support the “I don’t believe in making money on my art” mindset. The compulsive behavior to alter one’s identity and the inability to take responsibility for one’s decisions create a false sense of security. The individual feels safe, because they believe they are acting how artists act. Therefore, no matter what they do, they can always escape blame by stating that something goes against their artistic ideals. In addition, by refusing to take new clients or commissions, they never have to risk rejection or criticism of their own work. Through this examination, and in my opinion, pretentiousness is a symptom of an artist who refuses to move forward. They are comfortable being stagnant, and they will maintain their false reality indefinitely, because to challenge it would be to challenge everything that they have made themselves into. As a professional, I support people earning a living from the art they produce. You have to pay for the materials you use, and you have to be compensated for your time, so I don’t understand why some artists look down their noses at people who charge for their art/services. At the same time, I also support hobbyists. Many of them do art because they love it, because it’s therapeutic, and because they have to express themselves. They may not wish to make money off of the art they create, but they do not necessarily begrudge professional artists either. As long as the hobbyists keeps challenging themselves and keeps growing as artists, I will always support their endeavors. Finally, let me say this: doctors love saving people. Lawyers love fighting for justice. CEOs love running companies. None of these professionals are expected to work for free. I love what I do as a writer, so why should I, as an artist, be treated any differently than any other professional? Orginality isn’t the art. Anyone can come up with something original and than say they are artists. 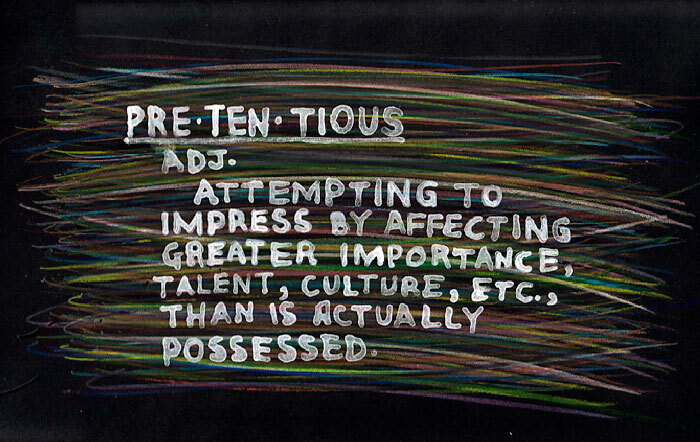 That’s why they all become so pretentious. On my earlier blogs, they are mega word-heavy with pretty much no pics or videos. My blogs from 2014/2015 and on do have more images and graphics, but still not many. I would like to add more visual content. I download a LOT of pics and include them, but I get antsy, since I can’t always attribute them to the right individuals/sources. I need to become better acquainted with the free-to-use graphic content places, and use those images. Do you have any recommendations on methods for including more visual content? Sounds like a whiny old pretentious artist wrote this to me! Wow, that grated on me tremendously. Artists need to calm down on how frequently they refer to themselves as artists and realise the delusions of grandeur at play here. They should also come with warning: irritant labels slapped on their foreheads.